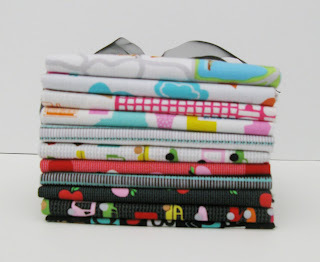 Do you ever make the exact same quilt twice? 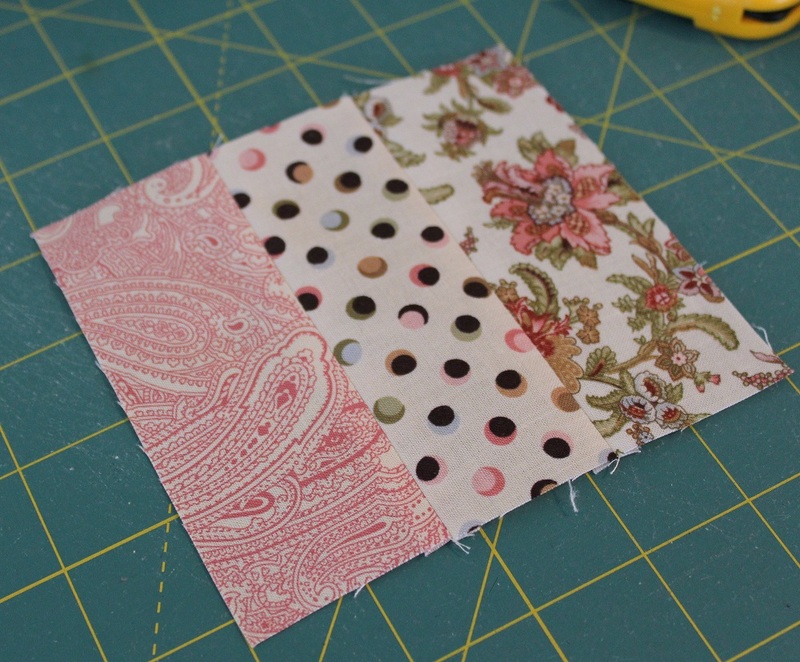 Many quilters reuse a favorite pattern over and over, trying out different fabrics or color palettes each time. But what about a room with twin beds? 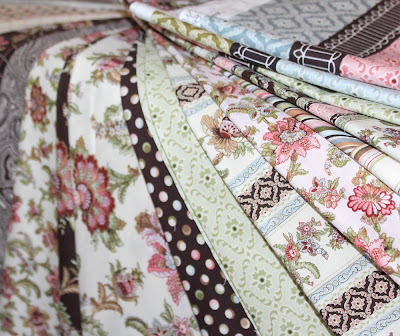 Would you make the same quilt, with the same fabric, a second time? Might get boring to sew. So jazz it up a little! 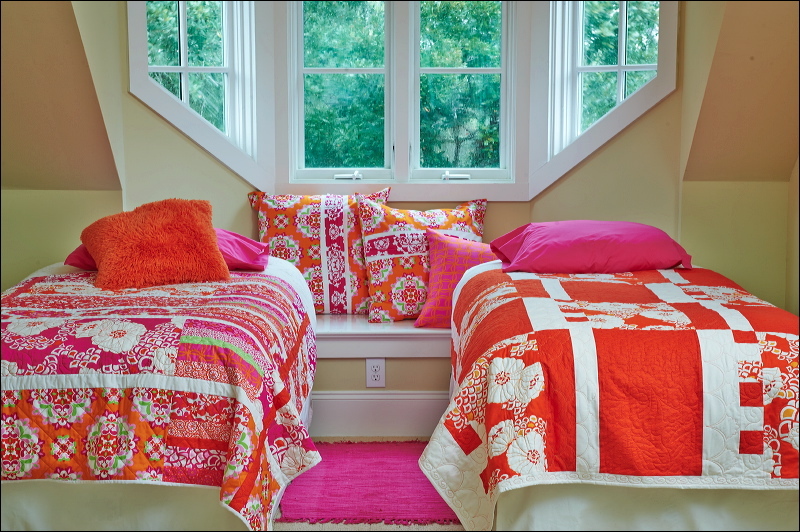 Designers Joanie Holton and Melanie Greseth avoided this situation when sewing quilts from Kanvas' Lili-fied collection—they used the same bold fabrics, but two different designs. The like fabrics tie the room together, but you won't get sucked into monotonous piecing! 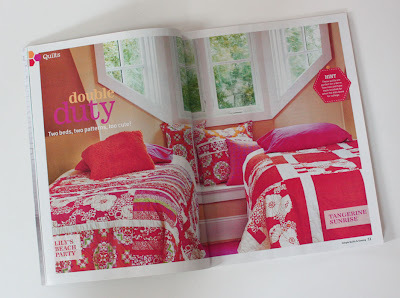 Both ''Lily's Beach Party'' and ''Tangerine Sunrise'' are featured in the current issue of Simple Quilts & Sewing magazine, appropriately under the tagline of ''Double Duty." How do you work as a team to come up with your designs? Melanie: Joanie and I tend to scribble and doodle ideas and then scribble and doodle on each other's scribbles and doodles… in most cases the quilts we design go through both of us at one point or another…. if she figures out a layout, I figure out the color…. if I have an idea for structure, she figures out how to construct… we are a team in every sense of the word. 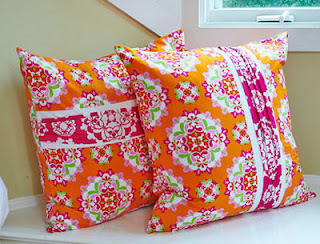 Have you ever made an all-orange quilt before? After creating the [Lili-fied-themed Kanvas] booth for Fall Quilt Market with all this fabulous color, we needed a ''rest'' for our eyes. So we made one more quilt—just with the orange—and called it ''Tangerine Sunrise." What attracted you to the fabric line? It is just so bright and fun! The line has really great color, which shines in the simple designs. See the entire Lili-fied collection here. 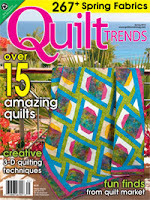 Find the kits for both quilts here. Find the pattern for the coordinating throw pillows here. Designers Joanie Holton and Melanie Greseth used the geometric motifs in Manhattan Modern to create "Side by Side," a deceptively complex looking (but easy to make!) quilt. Their quilt is featured in the Spring 2013 issue of QuiltTrends magazine. How did you come up with the idea for this design? We wanted a quilt with a stair-step look, but also wanted it to be simple. The quilt uses just one block! What attracted you to the Manhattan Modern line? What makes this quilt stand out in your mind? 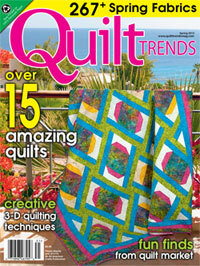 QuiltTrends also offered a sneak peek at another design using Manhattan Modern, called "Cubit." 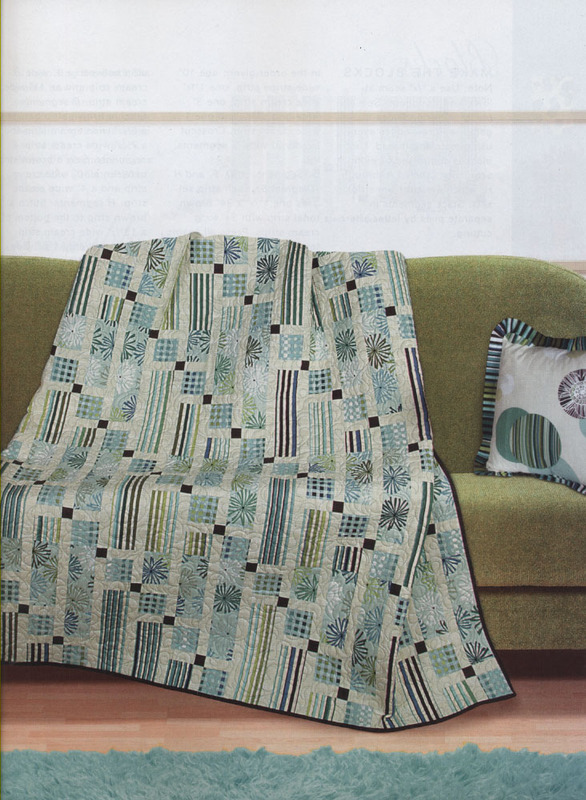 This quilt was designed by Stephanie Sheridan and Linda Leathersich of Stitched Together Studios. Visit their Facebook page to learn how to purchase this pattern and see it made in a few other Benartex fabric collections. See the entire Manhattan Modern collection here. Find a kit for this quilt here. Thanks to everyone who checked out Wendy's tutorial and entered the Antoinette fat quarter bundle giveaway! Kathy, we've sent you an email for your mailing address. 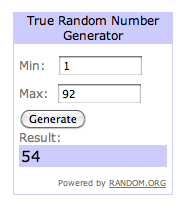 Congratulations to all four of our winners! We hope you enjoy sewing with your new fabric! We'll be sending the bundles out as soon as we hear back from the last two winners to get their mailing addresses. We hope you enjoyed our 4-day April blog hop! 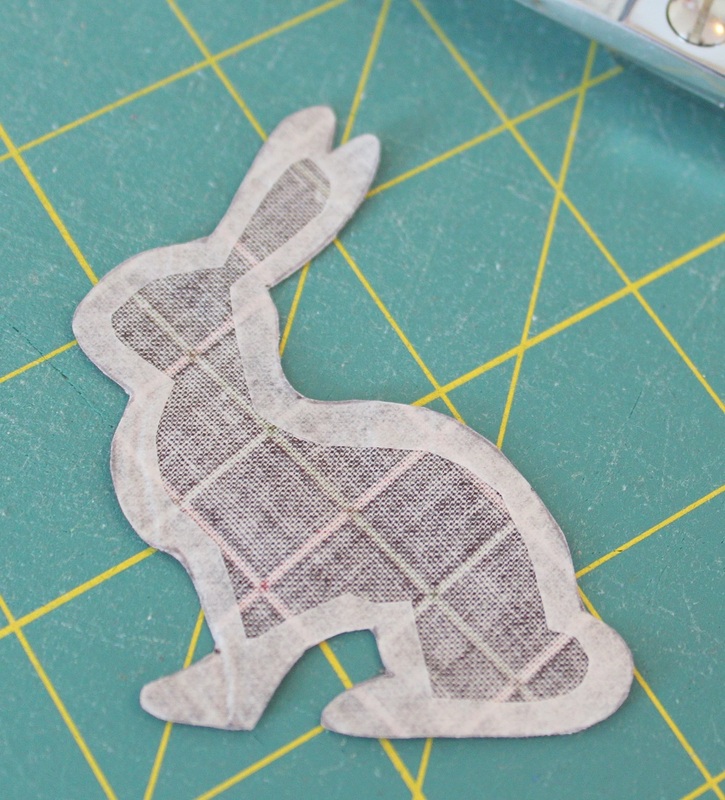 We have another hop planned for May with some fantastic tutorials--we can't wait! We'll announce the May blog hop dates both on the blog and on Facebook, so stay tuned. Congratulations, Nona! We are sending you an email to get your mailing address. 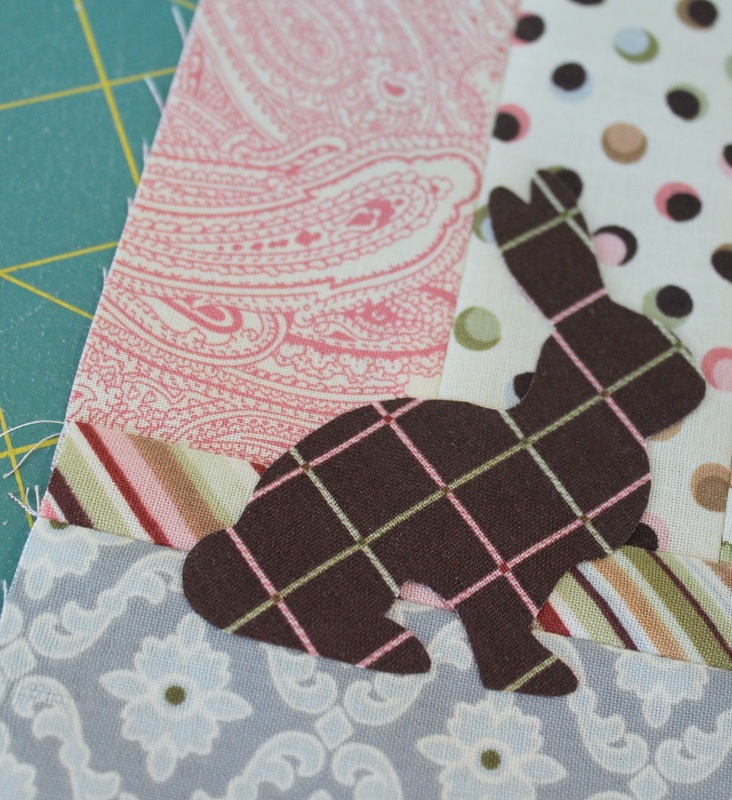 Welcome to the final day of our April Blog Hop! We hope you've enjoyed meeting these bloggers and seeing what they've created with our fabrics as much as we have! Today we have a sweet pillow ornament tutorial from Wendy at Ivory Spring. 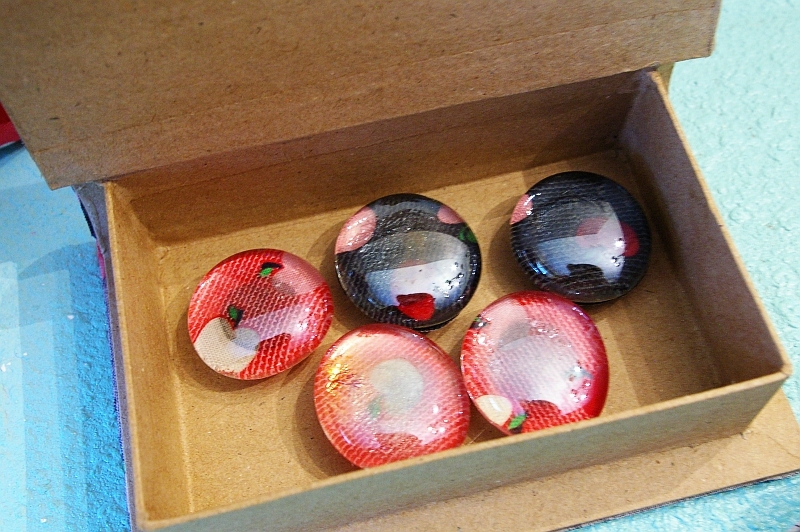 We've featured Wendy here on the blog before, so you may be familiar with her work, but be sure to check out her blog. 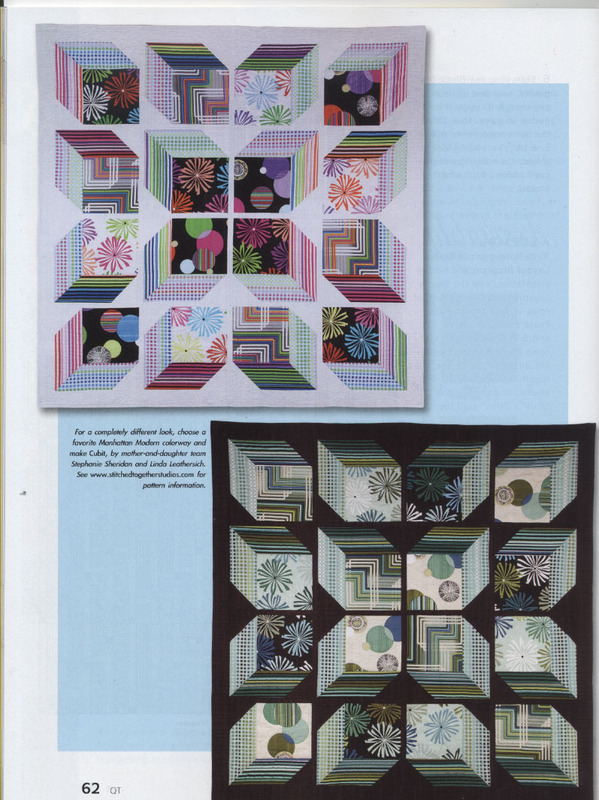 She does a beautiful job machine quilting her own work, and she's had quite a few quilts featured in magazines. 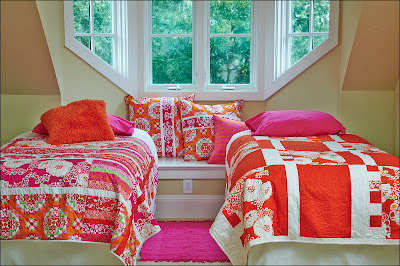 To add to the eye candy, she takes incredibly appealing photos of her quilts and the quilting she does on them. 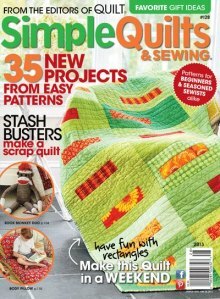 She's an inspiring quilter to follow! 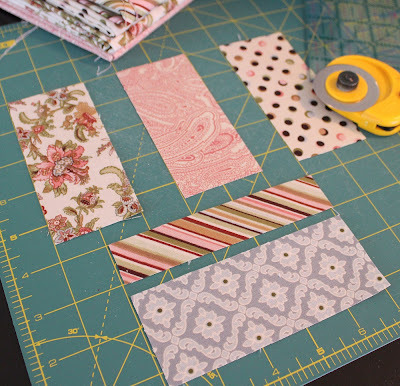 After you're done looking through her tutorial, make sure to enter the giveaway for a fat quarter bundle of Antoinette at the bottom of this post. And be sure to head over to Ivory Spring to say hello to Wendy and check out the free quilt pattern she designed using the Antoinette fabric line.! Hello, my name is Wendy Sheppard and I blog over at Ivory Spring. 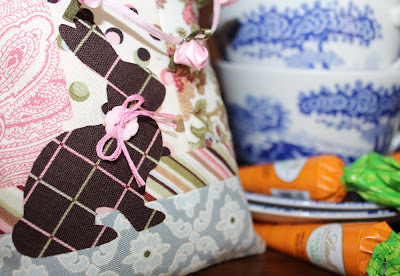 It is an honor to be part of Benartex's April blog hop! 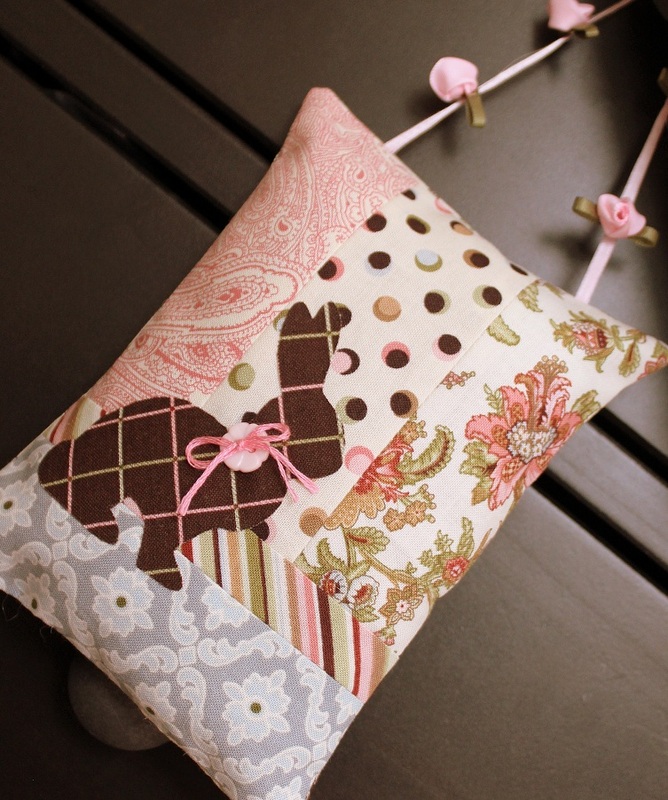 I am in love with pillow ornaments because they are super quick to make as gifts or decorative accents. 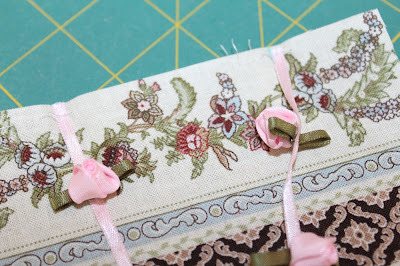 Today I am going to share with you a SPRING pillow ornament. 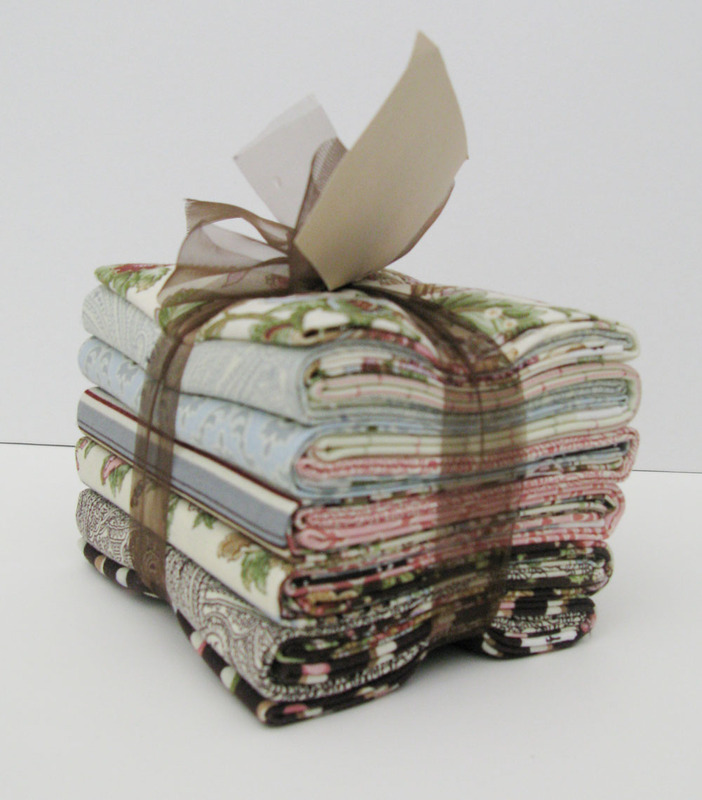 The fabrics I used are from the Antoinette collection. 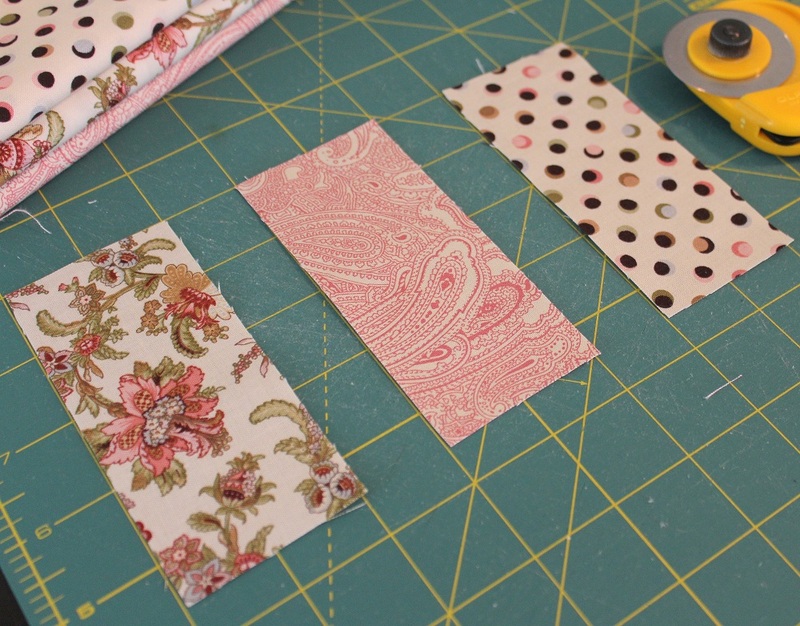 Tip: When cutting narrow pieces, I like to press starch my fabrics before cutting. I find that the pieces tend not to distort as much when being handled. 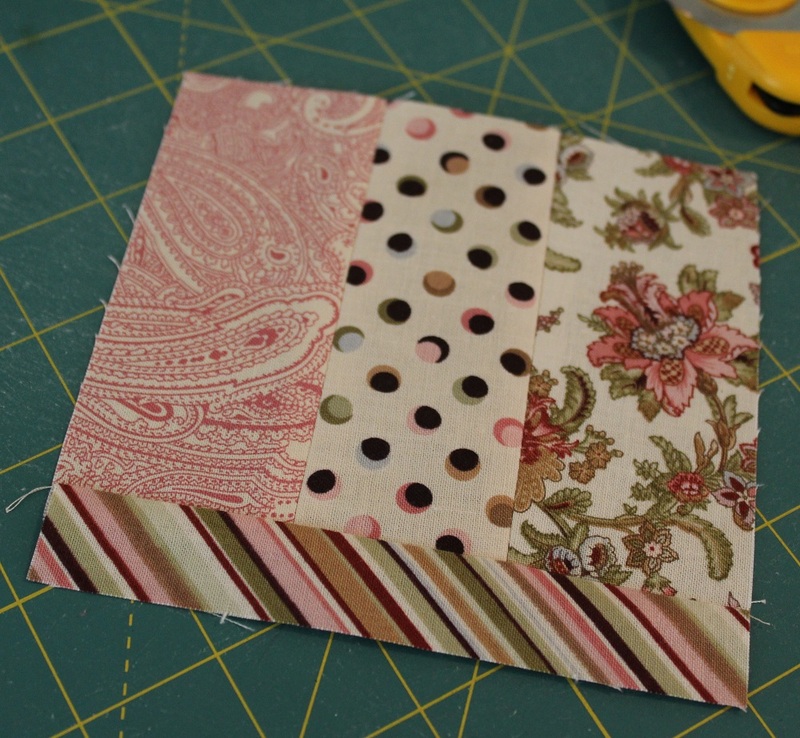 I sewed the 2" x 4-1/2" rectangles together. Then, I added the 1" x 5" rectangle. 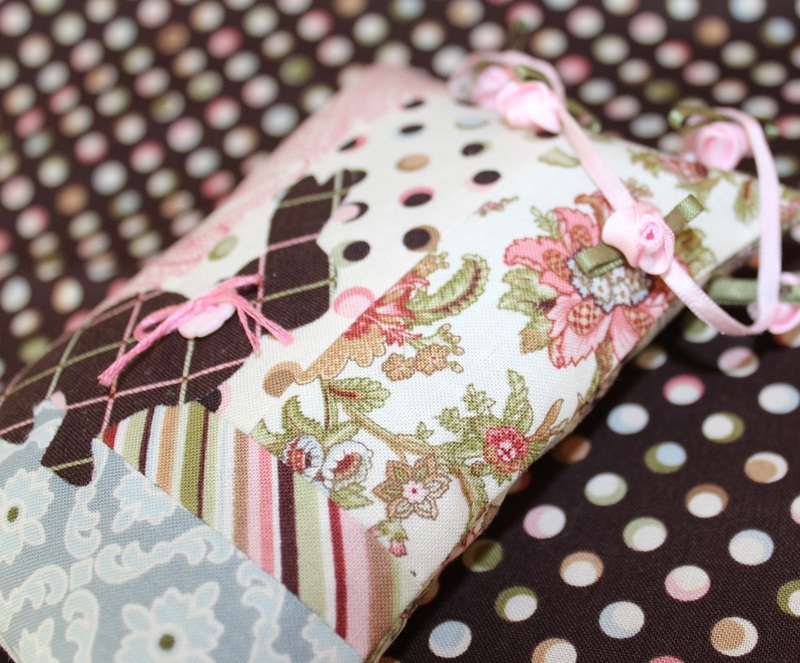 And lastly, I added the 2" x 5" rectangle to complete the pillow top. 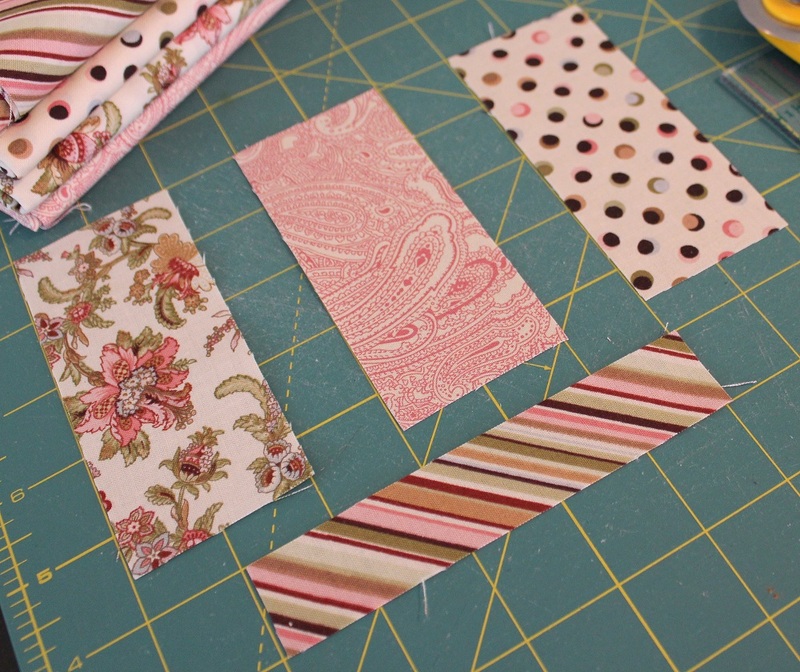 Tip: When sewing narrow pieces together, make sure you are getting a 1/4" seam allowance. 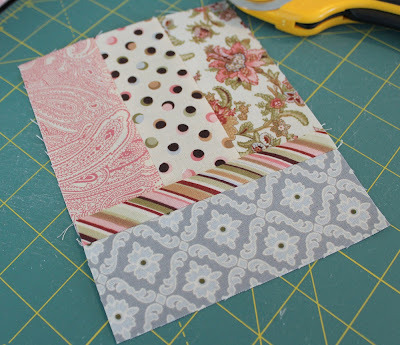 Next up is what I think is the fun part and further makes the project an open-ended one. Pick and trace the silhouette of a woodland animal you like that would fit the pillow top. I picked a bunny. 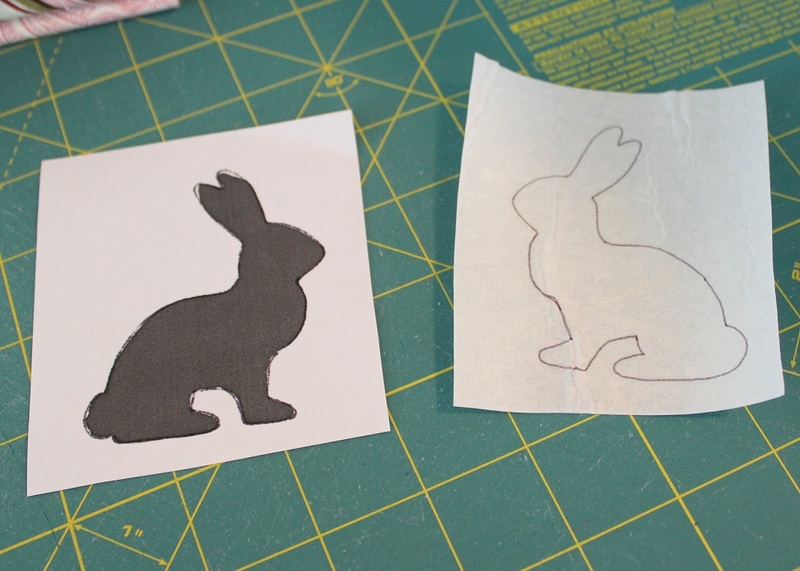 Then, I traced the silhouette in reverse on the paper side of a piece of paper-backed fusible web. 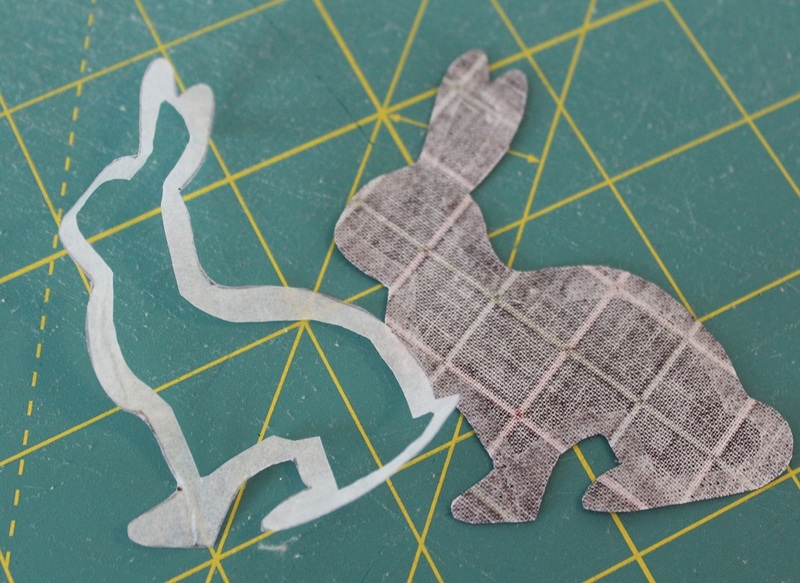 I trimmed the fusbile web inside the applique shape outline , and then peeled off the paper on the untraced side of the fusible web, and carefully placed the bunny on the WRONG side of my applique fabric. 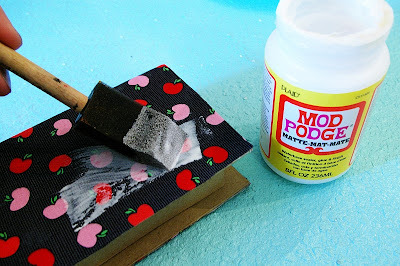 Press with a hot iron to fuse, using a pressing cloth. 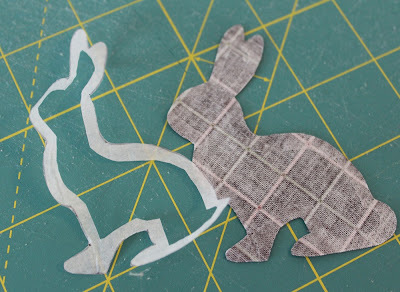 I used a pair of sharp scissors to cut out the bunny applique shape. 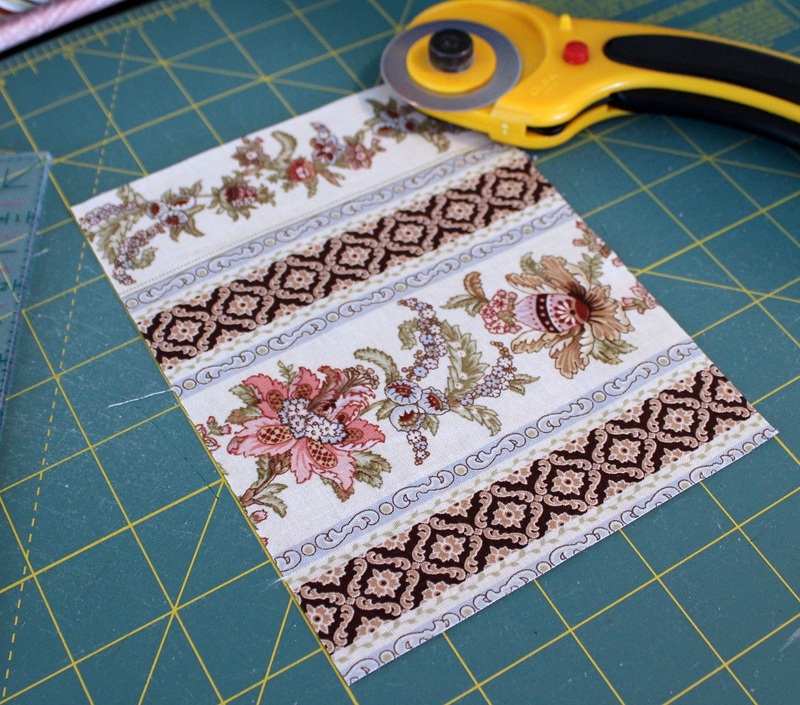 I then gingerly remove the remnant of the paper backing from the applique piece, and place the applique piece on the pillow top. 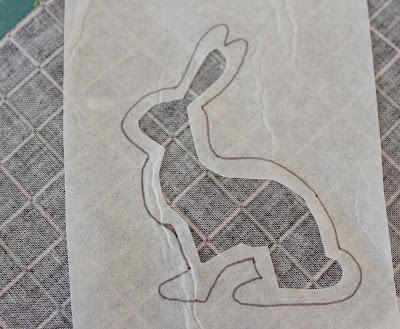 Once I am happy with the placement, I fuse the applique piece with a hot iron, using a pressing cloth. The next part is totally optional. #1. 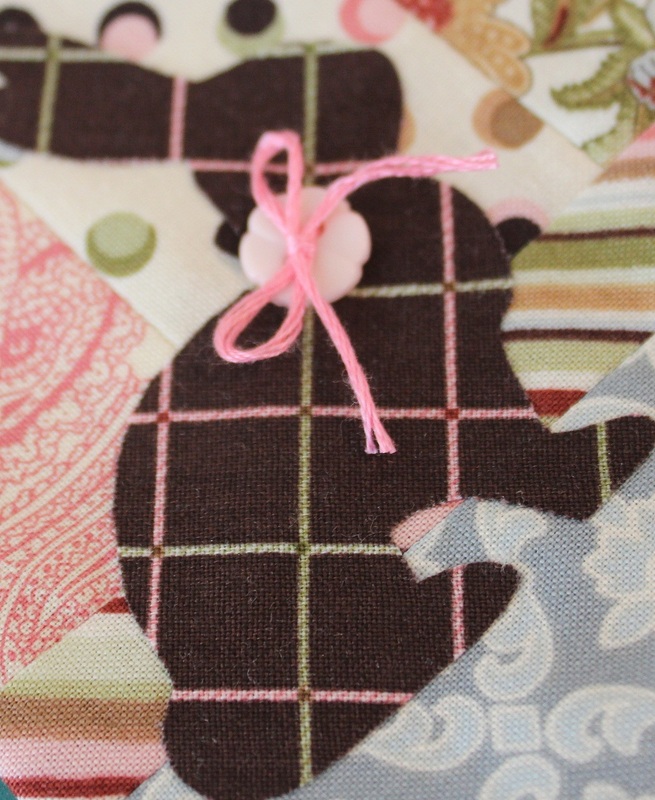 At this point, you may choose to finish by doing blanket stitching around the applique shape. I didn't for the bunny because I thought the stitches would be a little distracting on the overall look. So I made sure I fused the bunny onto the pillow top REALLY good. Click here to read about my tips on the blanket stitches. #2. I added a bit of embellishment at this point using a button and bow tied with embroidery floss. Mark 1-1/4" from the short edges of the pillow back rectangle, and anchor the ribbon ends at the markings. Place pillow back rectangle, right sides together, on pillow top. Pin and sew, leaving a 2" opening for stuffing. 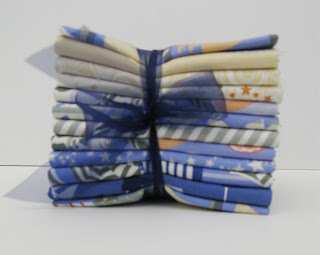 Clip corners, and carefully turn the pillow case right side out. Press. Stuff with stuffing. 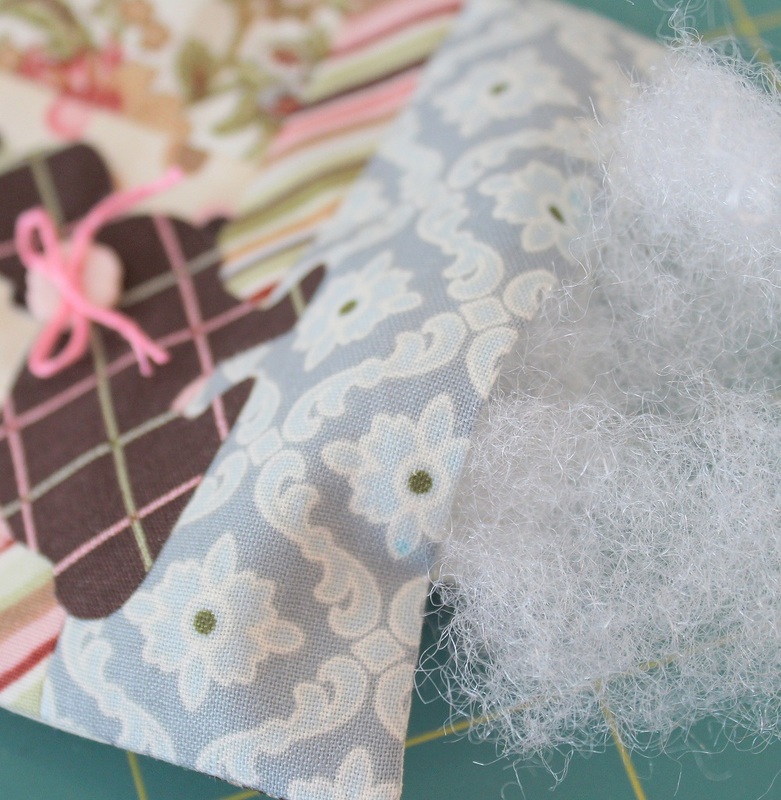 Hand stitch the opening shut to complete pillow ornament. p.s. Here's how to enter the giveaway for a chance to win a fat quarter bundle of Antoinette! 1. Sign up to follow the blog via Google Friend Connect or via email (right hand sidebar) and then leave a comment here, telling us that you have done so. If you're already signed up, great! Just let us know. 2. 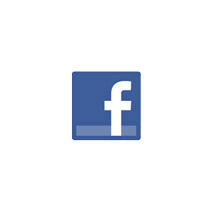 Like us on Facebook and then leave a comment here, telling us that you have done so. If you already have, great! Just let us know. 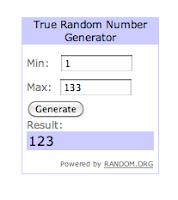 announce the winner Wednesday morning. 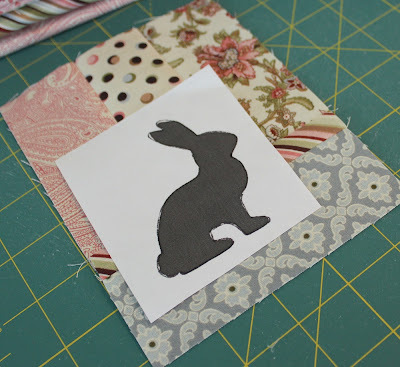 See the schedule for the entire April blog hop here. Happy Wednesday! Today's tutorial comes from Megan at Brassy Apple. Her blog's tagline is "Refashion, Revamp & Restyle Your Wardrobe & Your Life." We love Megan's blog because it branches out beyond the quilt world--she focuses on fashion, fun craft projects, and great ideas for creating with kids. Be sure to check her out--she's so prolific that we know you'll find something to love! Speaking of love, we adore her cute, crafty teacher thank you gift tutorial that she's sharing here on our blog today. After you're done here, head over to Brassy Apple for a chance to win a fat quarter bundle of the brighter colorway of The Big Apple from Kanvas. It's Megan from BrassyApple here! The BIG APPLE fabric line is bright, fun and has so many options for use! 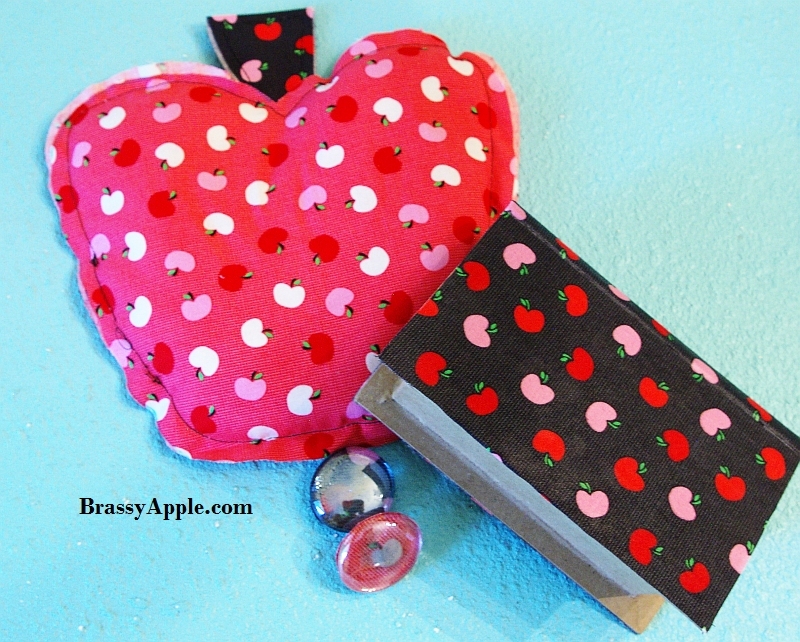 I decided on an "apple for the teacher" approach! It's a great way to say THANK YOU at the end of the year or HELLO at the beginning of the year! 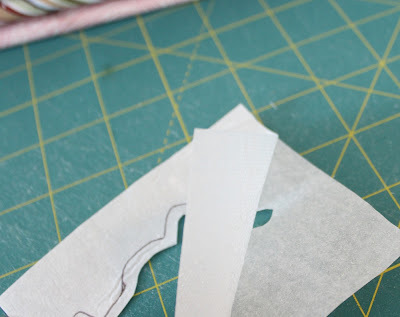 Lay your fabric flat with the wrong side up, trace around the book with your fabric marker and cut out fabric to cover the outside of the book. Apply a layer of Mod Podge in a small section and place your fabric over the top. Repeat on all the outside surfaces of the book until it is covered. Then apply a layer of Mod Podge on top of the fabric to seal it all together. Let dry and it's ready to be filled! 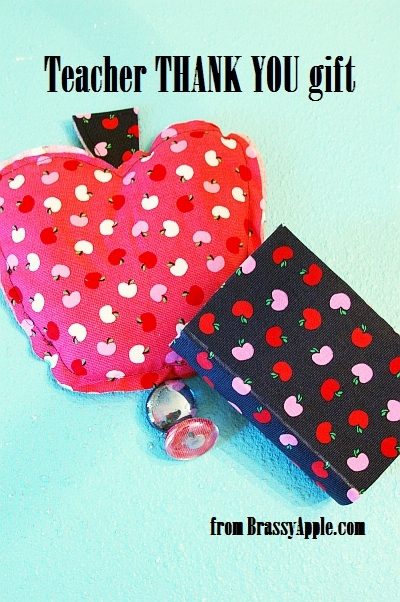 You could fill it with small cookies, candies, etc or make up some fun, useful gadgets for the teacher to use. 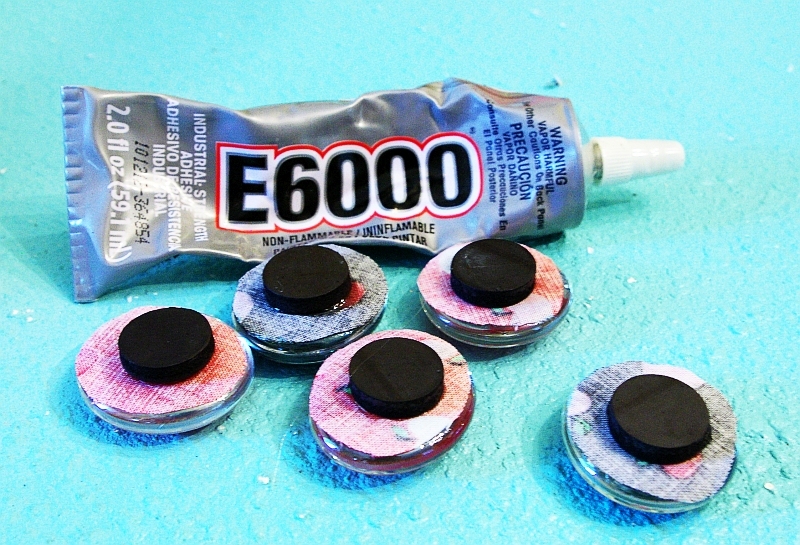 Like making some coordinating magnets! 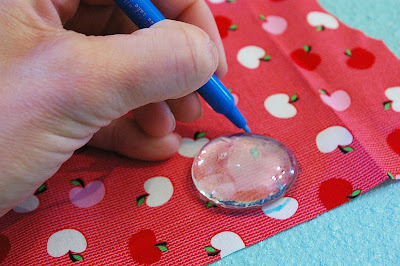 Place the craft bubbles on top of the fabric. Trace around them and cut out. Cover the back of the craft bubbles with E6000 glue and place the fabric on the underside right side up. Use the glue to attach the magnet to the back. Let dry. 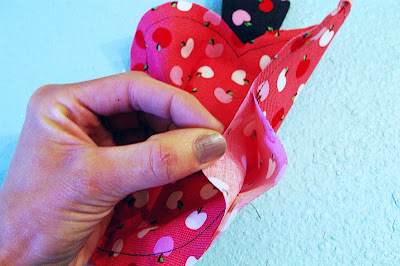 Fold your fabric lengthwise in half about 5 inches wide. Cut a half shape of an apple on the fold. 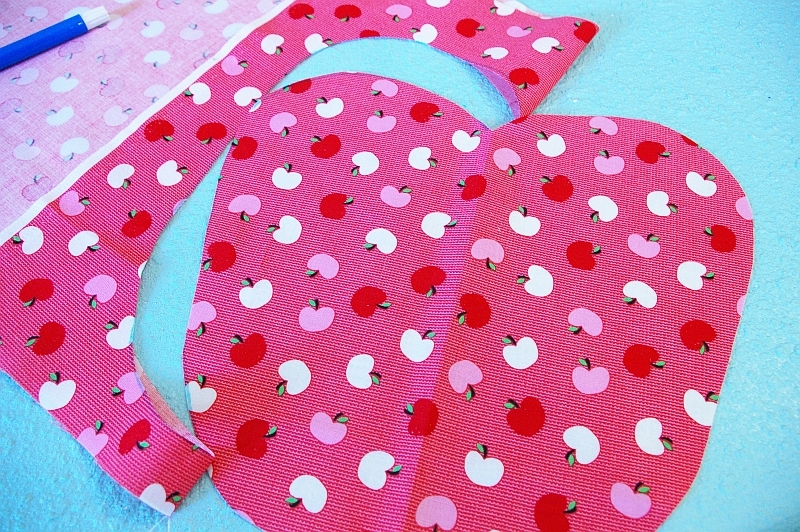 Think about cutting a heart shape but with more of a flat bottom to it. 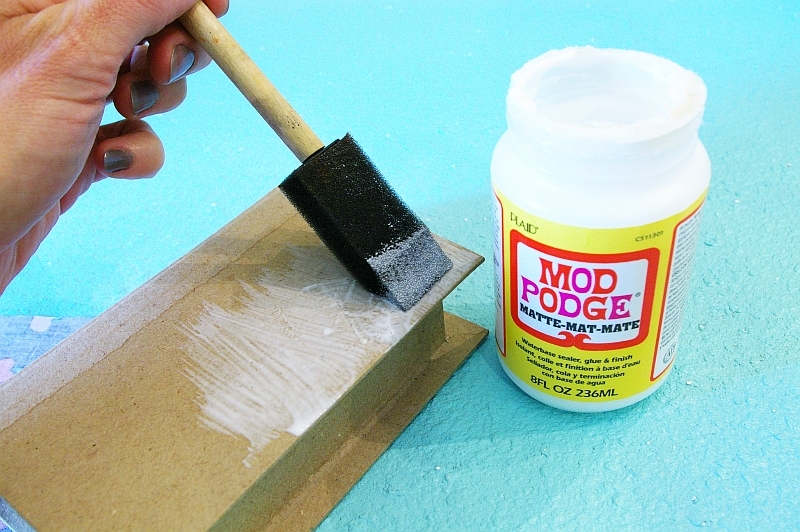 If you want to draw it out use a fabric marker. Open it up to see if you like the shape. Then fold, trace and cut another apple out using the one you just cut as a template. 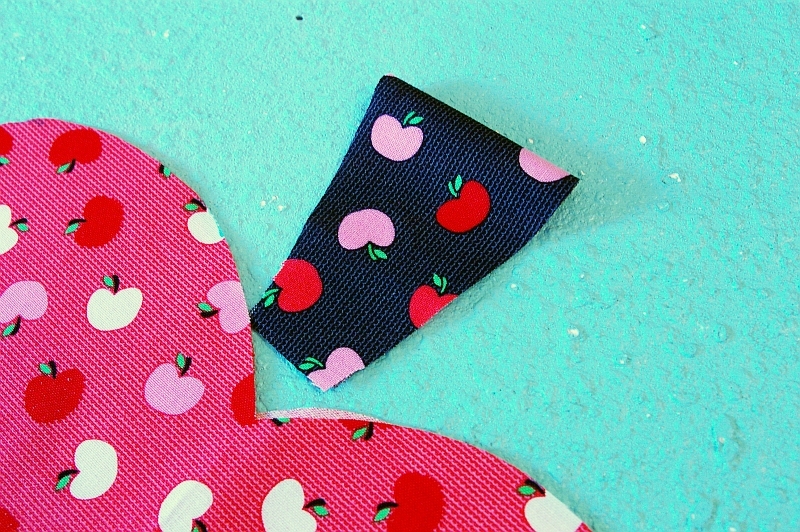 Using a coordinating fabric cut 2 hexagon shaped pieces (or just 2 rectangles) to use as a stem for the apple. Sew the sides and top of the stem piece. 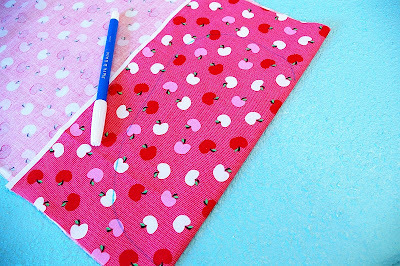 The bottom edge will be inside the apple piece so you don't need to sew it. Place the 2 apple pieces on top of each other, wrong sides together. 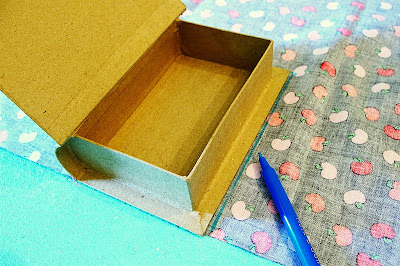 Tuck the stem piece in the top, pin into place, and sew around all the edges leaving a 2-3" opening one 1 side so you can fill the apple. Need a cute poem to go along with the Apple? There's one on my blog HERe! p.s. 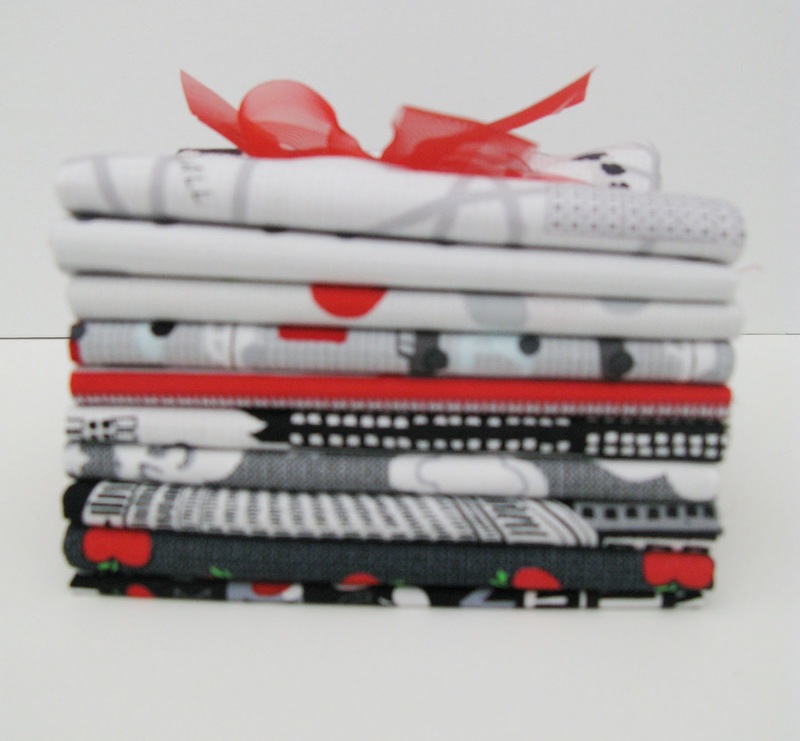 Don't forget to head over to Megan's blog to enter a giveaway for a chance to win a fat quarter bundle of The Big Apple! Down to the Final Two!